Discovered by scientists using the manned submersible Curasub in the deep-reef waters of the Caribbean island of Curaçao, a new scorpionfish species is the latest one captured with the help of the sub's two robotic arms. Found by Dr. Carole C. Baldwin, lead scientist of the Smithsonian's Deep Reef Observation Project (DROP) and based at the Smithsonian Institution in Washington, DC, Ms. Diane Pitassy, also affiliated with the Smithsonian in Washington, and Dr. Ross Robertson, Smithsonian Tropical Research Institute, Panama, the new species is described in the open access journal ZooKeys. In their paper, the authors also discuss the depth distributions and relationships of western Atlantic members of its genus. 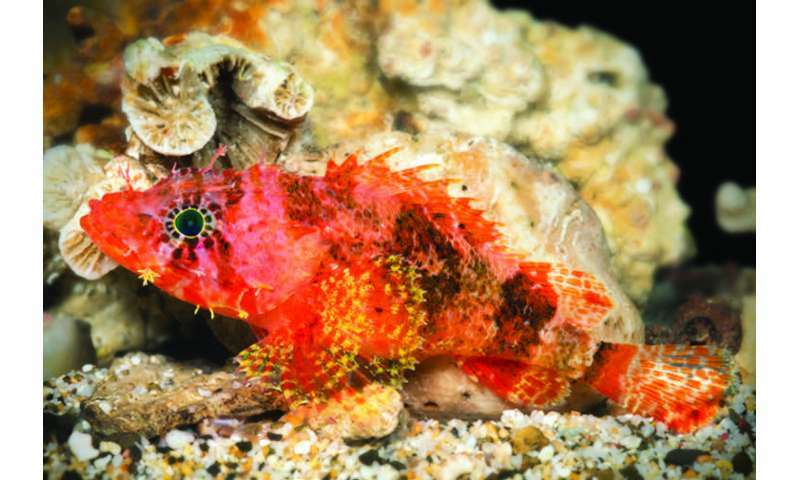 The new scorpionfish is distinguished from other similar scorpionfishes by a number of physical traits, including its distinctive bright orange-red colors, more elongated fin rays, and DNA. Inhabiting depths between 95 m and 160 m, it is also the deepest-living member of its genus in the western Atlantic Ocean. 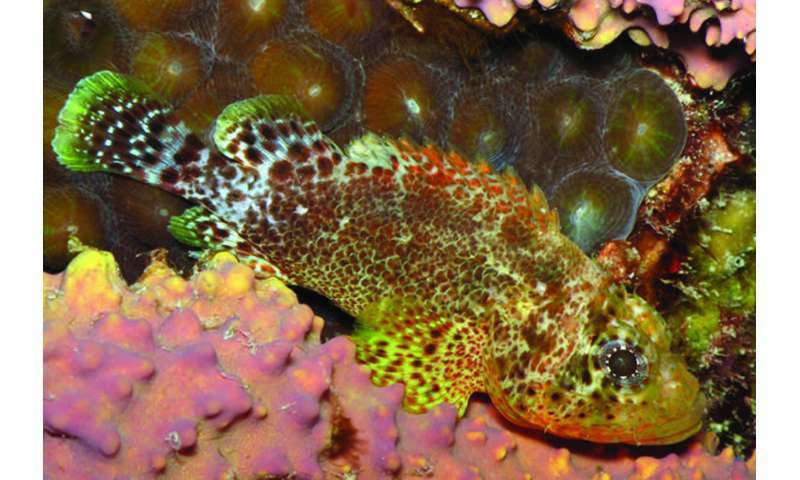 The new scorpionfish is officially called Scorpaenodes barrybrowni in honor of Substation Curaçao and freelance photographer Barry Brown, who "has patiently, diligently, and expertly taken photographs of hundreds of fishes and invertebrates captured alive by DROP Investigators," explain the authors. "He has generously shared his photographs, and they have enhanced numerous scientific and educational publications. It is an honor to recognize Barry Brown's contributions to science through his photography." "Fish specimens that are brought up from deep reefs only occasionally surface alive," explains Baldwin. When DROP scientists return to the surface in the Curasub with a living fish, Barry races it to his aquarium and begins to work his photographic magic." The new fish already has a common name as well. For the public, it will be known as the Stellate Scorpionfish, deriving from its star-shaped yellowish spots and the radiating pigment markings accentuating its eyes. The manned submersible Curasub reaches depths up to 300 m and is used by DROP and other marine scientists to search for tropical marine fishes and invertebrates, while conventional SCUBA divers are unable to reach deeper than 30 - 50 metres below the water surface. "The 50-300 m tropical ocean zone is poorly studied - too deep for conventional SCUBA and too shallow to be of much interest to really deep-diving submersibles," notes Baldwin. "The Curasub is providing scientists with the technology needed to remedy this gap in our knowledge of Caribbean reef biodiversity." The sub relies on two hydraulic arms, one equipped with a suction hose, and the other designed to immobilize the fish with an anaesthetizing chemical. Once anesthetized, the individuals are collected with the suction hose, which empties into a vented plexiglass cylinder attached to the outside of the sub. In January, the team of Drs. Luke Tornabene, Robertson and Baldwin discovered the Godzilla goby. About a year ago, Baldwin and Robertson stumbled upon another new goby species, which amazed the scientists with its love for the depths so much that they named it after the Curasub. 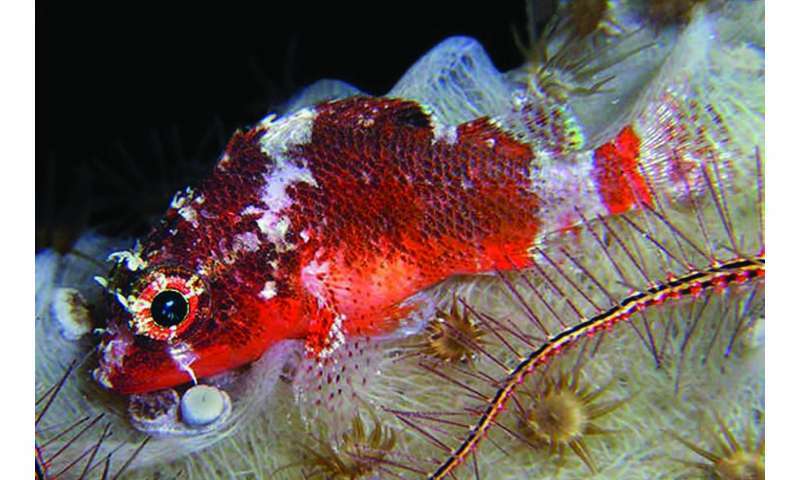 In 2013, the authors recognized the DROP research program in the name of a beautiful new species of small blenny fish, Haptoclinus dropi. "Stay tuned for more new discoveries," suggests Baldwin. "We have only scratched the surface of our understanding of the biodiversity of tropical deep reefs."